Careful assessment of customer needs is one of the most essential factors to create an innovative product and enlarge one’s market share in a particular industry. As a market leader for mobile computing products, Toshiba truly understands this principle. The launching of its latest feature-rich mobile projector, TLP-WX100U, highlights this. The product is offered at a very competitive and affordable price, and targeted particularly at business users and educators. Priced at $959 and granted a 3-year standard limited warranty, the Toshiba TLP-WX100U is designed to meet customized business consumers’ needs in terms of mobility, convenience, quality display, performance and cost. Weighing just 4.0 pounds, less than 3-inches high and about the size of a hardcover novel, business users could easily bring it around for business presentations. It is slim enough to keep in any bag while traveling without taking much space. This new mobile projector utilizes 3LCD technology for outstanding color reproduction and offers an impressive 2,200 ANSI lumens for bright display in any setting. Its 1280×800 native WXGA resolution with 600:1 contrast ration displays a superior and brilliant image for professional presentations and larger-than-life images for digital home entertainment. 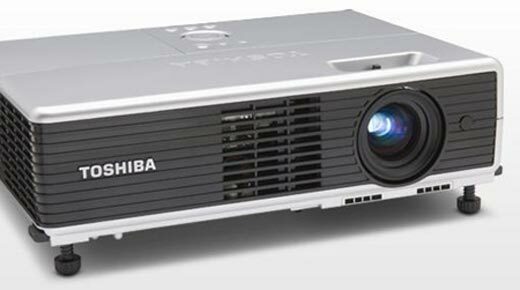 The Toshiba TLP-WX100U projector also has a feature called the “Blackboard” function. Sometimes due to space concern, users have no choice but to do projection for their presentation slides without a proper whiteboard or a projection screen. They might need to project the slides on a colour wall at their client’s office, a public area, etc. To enhance the colour performance and achieve quality visual results, the Blackboard feature in the Toshiba TLP-WX100U allow users to customize the projector to suit the wall color, e.g green, black, brown, blue or beige. Once users have keyed in the wall colour, the projector will automatically correct the color for a clearer display so that the display output will be clearer and more appealing. The other interesting feature in this TLP-WX100U projector is its close captioning function. This new feature allows the audience to read text or dialogue from a DVD player or television signal, benefiting viewers who may be hard of hearing, who are learning a new language, who are beginning to read, or simply who need some visual aid in a noisy environment. Busy businessmen also will find the quick power shutdown a useful feature. Without having to wait for the fan to stop and a complete system shut down like most conventional projectors, the Toshiba TLP-WX100U projector can be powered off once disconnected from the outlet with no cool-down time required. It saves time and is extremely useful for those who are rushing for meeting after meeting.